Philadelphia Phillies third baseman Maikel Franco is greeted by first baseman Carlos Santana after hitting a two-run homer against the Milwaukee Brewers. 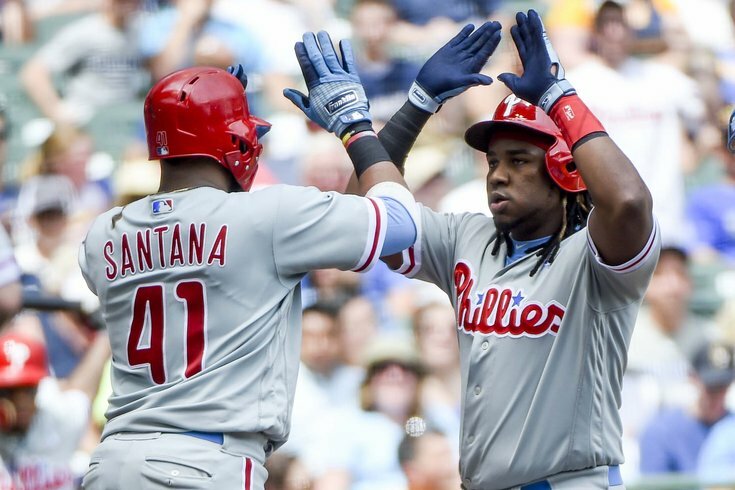 Maikel Franco creased a weak smile as he looked up while sitting in front his locker at Citizens Bank Park when the Phillies hosted the Milwaukee Brewers last week. The Phils’ third baseman was trying to put his best face on what has been a trying situation. Franco’s playing time has been limited since J.P. Crawford has rejoined the team from the disabled list on June 6. Since then, Franco has started twice, once in a 7-2 loss against Colorado on June 13 and again in Sunday’s 10-9 getaway game to win the series in Milwaukee, where he went 2-for-3, with a homer and four RBI. So far in June, Franco has had only 27 at-bats. In June 2017, he had 107 at-bats for the month, and by the same date, June 18, 2017, he had been to the plate 66 times. This season, he’s hitting .247 in 60 games (198 AB), with a .293 on-base percentage. His nine home runs are second on the team behind Rys Hoskins, who has 10 homers over 206 at-bats in 60 games. What makes Franco an important piece in the Phils’ lineup is he’s struck out just 31 times this season, on a team that is currently third in Major League Baseball with 670 strikeouts behind Texas (698) and San Diego (696). By sitting Franco for Crawford, whose natural position appears to be shortstop and is hitting just .189 over 90 at-bats in 32 games, the Phils seem to be implying Franco may not be a part of their future plans. Franco, to his credit, couldn't care less about the politics. He just wants to play. “When I get the chance, I try my best, but I don’t like sitting down, and anybody on [this team] is like that,” Franco said. “As a player, you want to just play and help your team, and that’s what I’m trying to do. It’s something that you can’t control. If I’m playing, I’m happy. If I’m not playing, I just try to get ready to do what I can to help. I’m getting used to it and I know the situation. I know what’s going to happen at some point. “I’m trying to get ready at some point for any situation. Keeping positive, having a good attitude, that’s me. That’s who I am. You have to be ready to go [when the chance to play comes]. I totally get it. I come in and try to work hard and get better every single day. I know I’m a better player [than what his stats show]. I believe in myself. I believe in what I have to do to get better. That’s what it is, man. Some point, that’s what is going to happen. After the Phils’ win on Sunday, Gabe Kapler praised Franco's performance, specifically his ability to adapt to no longer being an everyday player. But the first-year Phillies manager maintained that third base is "a fluid situation." "We've had a lot of guys change roles: Aaron Altherr, Nick Williams, Franco Hector [Neris]. And they've all been incredible throughout," Kapler told reporters in his post-game press conference. “In particular, Mikey has shown an incredible attitude recently. And that's all a manager can ask for. That, and maybe a slightly higher on-base percentage. Since returning from a fractured jaw, Rhys Hoskins has hit four home runs and knocked in 11 over eight games. He’s hitting .333, going 10-for-30, which includes two doubles and four walks.